Picked this one up for 33 cents at the Greenville Comic Con last weekend. It's part 2 of 2, I think, but that's alright. The way I see it, that means I only need one more issue to get the whole story! I am fairly intrigued as to why Blackfire has Wingman's gear on, especially considering her role in Rann-Thanagar War. Hmmmm. Walt Simonson could do nothing but covers for random DC comics for the rest of his career and I would be happy. I like the "two-toned" nature of this cover, and the dynamic look of both combatants chosen weapons. Nice stuff. Heading down to the LCS today? Then be sure to check out these new Hawk-related arrivals. Blackest Night #4 -- Not many titles this week but this one's a doozy at least. No doubt that the Black Lantern Hawks will have some dastardly tricks up their proverbial sleeves. I imagine that this will be the turning point in the story, as we will be halfway into it, and we will get more of an idea of the overall story here. I have been really digging this book and very much am eager to get my hands on it. And the week of Halloween to boot! Green Lantern #47 -- Haven't been reading this title, despite being BL-related, but as always there is a chance of either the Hawks or Khufu and Chay-era popping up here in zombified form. This weekend at Greenville Comic Con, I picked up a very curious item: a small (maybe 3" tall), green plastic Hawkman toy. It very much looks like something which would have come from a Justice League of America Army Men set. In fact, there were other members of the JLoA, and in various colors as well. I have not been able to take a picture yet, but I believe it is stamped 1981 on the base. Anyone out there have any information? I did a cursory search on the web and came up empty. A picture will be forthcoming... and by forthcoming I mean sometime soon, hopefully! 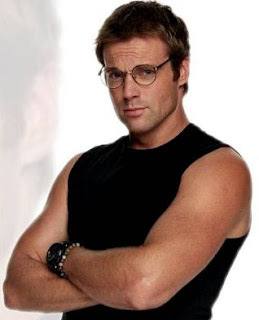 We have been hearing strong rumors about Hawkman appearing with some of his fellow Justice Society members this season on Smallville, and late last week we got confirmation on the actor who will be playing the Winged Wonder: Michael Shanks, who played Daniel Jackson on the various Stargate TV shows. I never watched much Stargate but I think Shanks has a fairly good look for Hawkman on the small screen. He looks to be in good shape, which is a plus, although I imagine he will not be bare-chested. His face conveys intelligence and intensity, which are the two traits I think are most important for a live action Hawkman. He is a little young but it is Smallville after all. And he does look like a museum curator. How exactly he will be costumed and portrayed (ie, alien or human), we don't know yet, but with Geoff Johns handling the writing chores I am leaning towards Egyptian Prince over Space Cop. 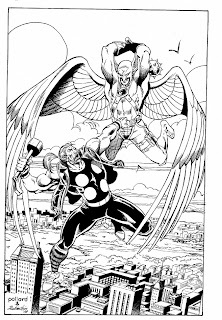 Yes, Hawkman will have wings. And a big mace. Oh. And he and Green Arrow don't get along. At all. Oh yeah, baby! It's on now! Image: Michael Shanks, ?? ?, retrieved from Blog@Newsarama. As near as I can tell, there is no Hawkman or Hawkgirl related stuff on the release list for this week, so I thought I might take a moment to talk about some of the other stuff being released by DC instead. 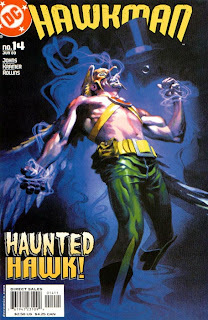 DCU Halloween Special 2009 -- The Halloween Specials DC has put out since they started the holiday books up again. I remember last year's really being a dud. The Holiday Specials have been better, but I have high hopes for this one. Doubtful we will see the Hawks, but you never know. Justice League of America #38 -- The beginning of the end for the current team, as this issue apparently features Despero beating the ever-loving crap out of the Justice League in order to facilitate James Robinson's incoming version of the team. I am torn on what I think about the new lineup. I like the "new Trinity" in principle, but I don't really know much of anything about Mon-El nor Donna Troy. Personally I hope that Donna gets a nickname which sticks, for one thing. I am also torn on the former Teen Titans. Cyborg is a good fit, but Starfire I am less sure about. Of course, most of my exposure to Starfire comes from the Teen Titans cartoon, so that is a clouding factor. Atom, GL, GA, Guardian, Congorilla, though: bring it on. Should be a fun ride either way. Outsiders #23 -- I just want to say that the format and pacing of this storyline is exactly what I want to see in my comics. Hopefully this will continue on once Dan DiDio takes over writing chores. Summary: In the swamps of St. Roch parish, the Gentleman Ghost appears before the half-crazed Chief Nedal, telling him that he will help the officer if he does him a favor -- one which involves reloading his gun. Meanwhile, Hawkman and Hawkgirl are still fighting, with Hawkgirl demanding vengeance on Nedal for murdering her parents. Just as Hawkman manages to pin her down, the Ghost appears to the heroes. He taunts them, since a mortal cannot touch a spirit, and explains to them that when he met them for the first time, it was in the mid-1800s, when "they" were known as Nighthawk and Cinammon, respectively. "Gentleman" Jim Craddock's death at the hands of Nighthawk (who thought Craddock was forcing himself on Cinammon, when in fact they were tussling over an attempted larceny) transformed him into the Gentleman Ghost, forced to wander the Earth forever since the souls of those responsible for his death cannot pass on. He cruelly tells them that he has sent Nedal to their "temple," the museum, because it amused himself. Back at Stonechat, Nedal almost immediately opens fire, hitting Jayita in the gut and clipping Officer Isabella in the shoulder. Danny and Nedal struggle, with Nedal chasing the young man throughout the museum. The Hawks arrive to save Danny, and Nedal is on the run from the Winged Wonders. With the Chief subdued, Hawkman wants to hang him with Craddock's noose for killing Jayita, but Kendra stays his hand. That doesn't stop the Gentleman Ghost, however, who does the deed himself, leaving Nedal hanging off the widow's walk of Stonechat. The truth about Nedal is made public and the Hawks given a pass by the media. But one new arrival wants to get to the bottom of this new Hawkman, and readies to make herself known: Shayera Thal, Hawkwoman of Thanagar. Review: The art in this issue is handled by guest penciller Don Kramer, who has done some work on Batman and Detective Comics, as well as the current JSA vs Kobra miniseries. His work is straightforward and trim, a big visual change from Van Sciver's work in the last issue. Other than the complicated manner in which he draws the lenses on the helmets, his work is not a bad fit for the Hawks, although his Gentleman Ghost is not afforded the same special effects coloring that EVS got. Anyway, I really like this issue, as it wraps up a major plot point, brings back a major bad guy, and has one hell of a last page teaser. Johns does a good job of detailing the Ghost's motivation and point of view. It is not very surprising that after Johns essentially brought him back around this time that his stock has risen considerably in the larger DCU, including his various animated appearances. All in all a good, concise two-parter and a very strong Hawk adventure. Image: Hawkman v.4:no.14, 2003, Andrew Robinson. Heading to the beach to go fishing... so no blogging for me! I'll see everyone back here Monday morning! It's Wednesday, which means new comics! Do we have anything fresh featuring the Pinioned Powerhouses this week? Blackest Night #1 3rd Printing -- In case you missed the first two printings, you too can see the murder of Hawkman and Hawkgirl and their resurrection as Black Lanterns! ... I guess I shouldn't have spoiled that, since ostensibly someone buying the 3rd printing might not have read it yet... oh well. Green Lantern Corps #41 -- After the reveal of sorts of the "Lovers" in a recent issue of Green Lantern, something could be made of either them or the regular old Black Lantern Hawks in this issue. I am buying the main Blackest Night book, but not the tie-ins. I wonder how DC will collect these comics? Trinity v.3 TP -- I believe this finishes up this weekly series, which at some point I am going to have to bundle these together on In Stock Trades or something. Seems like a lot of money, sure, but you know me and Hawkman. The Atom And Hawkman Coming Back? Well, for one month at least! 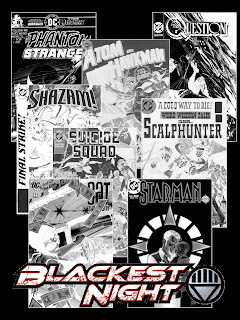 DC announced at the current Baltimore Retailer's Summit, DC Head Honcho (and upcoming Outsiders scribe) Dan DiDio announced that in January, 8 titles are being resurrected as part of Blackest Night, and The Atom And Hawkman is one of them. It's even coming back with it's original numbering (and we didn't even have to send in any postcards or anything). - ATOM AND HAWKMAN #46 Geoff [Johns] brings you the double date from Hell, The Black Lantern Hawks work to reunite Atom with his long dead love, Jean Loring. You can see a little bit of the cover, although it is in black and white and negative-reversed, and obscured, in the image. To me, it looks like Jean Loring is the Slaver Queen, which I guess makes perfect sense! Of course, here at Being Carter Hall we have been calling for the return of The Atom And Hawkman as a $3.99 co-feature title for months now. While this is not quite that awesome, it is definitely a step in the right direction. Should be a cool event, and I am definitely looking forward to seeing all the classic trade dress in play! Image: Blackest Night One-shots promo image, 2009, retrieved from The Source. Summary: At the Stonechat Museum, the DEO arrives to arrest Kendra for the murder of a police officer when she was a girl. The St. Roch police have been trying to contact Carter, but they have not been able to reach him (since the Hawks were on their Himalayan adventure). As the DEO places Kendra in custody, Hawkman smashes a police cruiser with his mace, but Kendra tells him that he can't help that way. In the car, Kendra finds that Chief Nadal is driving the car, and that he plans to run away with her. When she asks him why, Nadal tells Kendra that he loves her, and she has an immediate revelation: Nadal is one of the police officers who tried to assault Kendra and her mother all those years ago, and caused his partner to be shot and killed. Kendra accuses Nadal of murdering her parents, which he admits, saying they were getting too close to uncovering him after he made a new life for himself in St. Roch. Kendra then slips her handcuffs and lashes out at him, sending the car careening down a hill and into a swamp, catching fire. Nadal escapes, and Hawkman arrives in time to pull Kendra from the back, who then retrieves her helmet and wings from the trunk. 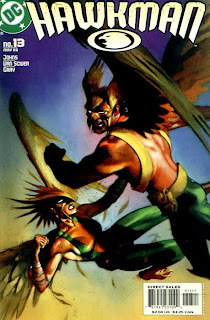 Hawkgirl tells Hawkman of Nadal's confession, adding that her touching of the Absorbascon restored her repressed memories of this life, and grabs one of his spears, intending to kill the police chief. 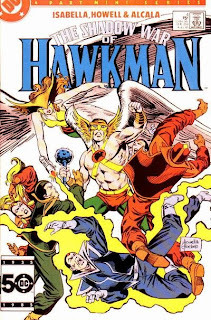 Hawkman tries to stop her, but Kendra's rage is implacable, and the two Hawks tangle furiously in the sky. Meanwhile, Nadal is trying to find his way out of the marsh when he runs right into the spectral form of the Gentleman Ghost! Review: When I first read this issue, I was floored! Nadal, the man who murdered Kendra's parents? I guess it's not that surprising, considering his somewhat over-blown interest in Kendra, but I figured he would be to Kendra like Jayita was to Carter initially. Needless to say this is a much different direction. Geoff Johns captures Hawkgirl's fury really well, and her venom in arguing with Hawkman in the swamp. Guest penciller and frequest Johns collaborator Ethan Van Sciver's Hawkman looks great, but his Hawkgirl has a weird angular thing going on which just looks a little bizarre. Needless to say he has gotten better at the female form. His Gentleman Ghost, though, pretty much makes up for any shortcoming (including some insane sfx coloring from the crew at Heroic Age). A very strong story, starting to wrap up one of the introductory plotlines from the series, which is always nice. I like protracted mysteries as much as the next guy, but it's always good to have them solved, too! Image: Hawkman v.4:no.13, 2003, Andrew Robinson. The Thanagarians are coming for YOU! As I said the other day, I am a sucker for this type of gag in comics, and this is one of the better ones of this type. They really are coming for you! Image: Panel from Shadow War of Hawkman #4, 1985, Richard Howell. Can we expect to find anything related to the Winged Wonders this week at the local comic shop? Let's find out. JLA Mini Neon Sign -- Yeah, we're feeling the loss of Wednesday Comics with the inclusion of this item right here. Considering the rate at which DC is putting these things out, we should be getting a Hawkman sign right after Martian Manhunter and right before the Phantom Stranger. 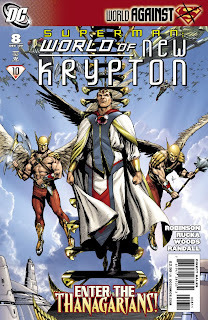 Superman: World of New Krypton #8 -- Featuring an encounter between the New Kryptonians and Hawkman's "people," the Thanagarians. Is the solicitation text just a mistake, or is it a subtle hint that there is more to this than meets the eye? I really think that Dan DiDio wants a Space Cop Hawkman winging around the DCU, so you can bet I am going to be reading this issue with a fine toothed comb for any potential candidates for a "new" Katar Hol. Wow... that would be an elegant solution, wouldn't it? Just make a new Hawkman, not named Katar and start with a blank slate? Sure it would piss off lots of people but maybe you could give him memory implants via an Absorbascon or something. That'd give us our Space Cop with all the continuity baggage, for sure! Well folks, I was doing some thinking about the blog over the last few days and have come up with some features and content which I hope to introduce or implent in the coming weeks and months. -Introduction/"Who Is Hawkman?" -- The inspiration for this post. Even though I have stated that I was not (and to certain levels still am not) a Hawkman expert, I never thought about those who might find this blog who literally have no idea who Hawkman is. So I am going to be working up a primer of sorts which will stay permalinked in a prominant spot on the front page, where new readers can get a quick catch-up. Furthermore, I want to use this space to explain terms I use on here a lot (I have gotten several questions on just what I mean by "retcon status"), and hopefully clear things up for the non-comic book fans out there. The problem, of course, is that this is going to take some time to make really clear and understandable, especially considering the pre- and post-Hawkworld Katar Hol. -Villain content -- I know I promised this last time I did one of these posts, and I am still working on exactly how I want to present this, but these are coming. I promise. 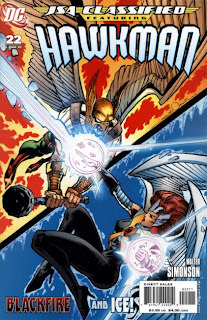 -Hawkgirl/Hawkwoman content -- See what I said about villains above. -Hawktoys -- Besides actually opening up and talking about the Hawk-related toys I have, I want to track down the ones I want but don't have, as well as shine a spotlight on some more obscure, older, or otherwise hard to find toys. -Hawk essays -- I tend to get ideas jumbled in my head, so maybe it would be better for me to get them down on paper and organize them rather than let them rattle around in there. I was doing pretty well with this at the launch but have since slacked off, and I want to get back into it. -Wednesday Comics -- Now that the series is done I'll finally get around to posting about it! Actually I want to read the full story in one sitting and then get into each strip. That actually was my plan from the start so I don't feel so bad about this. In addition, I am really going to try to get back on track with my Volume 4 reviews, as well as finishing up Rann-Thanagar Holy War. So, readers? What else would you like to see? What can I improve upon? I'm always up for criticism (as long as it's not about how much cooler Green Arrow is or something like that...) and improving the blog. So any thoughts or feedback are greatly appreciated. 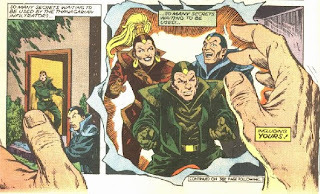 Title: "No Sound Of Clashing Wars"
Summary: Rab Mekir, tied to the Absorbascon, seeks out the secrets of key humans throughout the world, and the Thanagarian invaders seek them out and entrap them to do the aliens' bidding. Meanwhile, in The Bunker in Detroit, Katar and Shayera are being taunted by Fell Andar from their ship, which he has captured. Now that they have taken control of all of the Hawks' Thanagarian weapons, Fell's invasion is set to amp up to a full scale level. The Hawks figure out a quick plan, and ride a Relativity Beam to their ship, where they are quickly surrounded. But the heroes are one step ahead, having programmed the Beam to teleport them from the bridge to the computer room, where they overtake the guard and begin to override the master computer. While hacking the computer, Hawkwoman discovers that Fell has programmed the ship onto a collision course with Detroit. Suddenly, the Thanagarian guard stabs Hawkman with a screwdriver, and the rest of the invaders evacuate all of the air out of the room. With time running out, and the invaders cutting through the wall to come and kill our heroes, Hawkman and Hawkwoman make a hard decision, and program the ship to self-destruct. The Hawks survive, by riding the Relativity Beam back to Earth. While they confront the fact that they were forced to kill their own countrymen, the Hawks head back to Grinder's Bluff, and find Rab Mekir still in agony hooked up to the Absorbascon. While they talk about what to do with him, Fell Andar pops up and tries to kill our heroes once again -- but he doesn't get the chance, as Rab blasts his commander with a mental bolt, seeming killing both of them. The adventure over, Carter and Shiera Hall retake their places at Midway City Museum, with a Commander Frazier in their confidence and a new museum artist being interviewed. But all is not as it seems, as one of Fell's agents is still on Earth... the battle is over, but the war has just begun. Review: The first salvo of the Shadow War finishes up here in fairly satisfying fashion. There's actually a bit less going on in this issue than the last, but that's alright because there's a bit more action than plot is all that means. It's a very straightforward story, but it does have some really nice touches. One which stands out in my mind is the initial prologue, which features the Thanagarians going out and cornering various humans to their own ends. This includes a panel where they bust through the comic and come right at the reader! I'm always a sucker for that sort of sight gag. Image: Shadow War of Hawkman #4, 1985, Richard Howell. Over at DCU: The Source, we have a 7-page preview of the upcoming Superman: World of New Krypton #8, which features lots and lots of Thanagarians. Woo! Most interesting to me of these images is the cover itself... notice the two Wingmen sporting Honor Wings! Most unusual. can't remember the last time we saw a Wingman with Honor Wings who wasn't, you know, the star of a Hawk book. The solicitation text also has a very intriguing little snippet: Can Superman keep things peaceful between the two races – or will The Man of Steel discover that Hawkman's legendary temper is shared by all his people? "[A]ll his people" huh? More evidence to a return to a Space Cop Hawkman, perhaps? Also of note is that there is, apparently, a variant cover by Joe Kubert, but DC does not have it pictured on their website, oddly enough. Image: Superman: World Of New Krypton #8, 2009, Gary Frank. Our "sketch" today is actually an inked commission from Keith Pollard with Josef Rubinstein on inks, and features the Pinnioned Powerhouse laying a beat down on the Ponytailed Punkass, AKA Thunderstrike! I am most familiar with Pollard's work on Iron Man, right after the century mark on his title, but his most well known run was on Thor starting in 1979 and lasting for a few years on the Thunder God's book. He did handle a few issues of Thunderstrike, as well. Near as I can tell, he has drawn Hawkman in one comic -- Justice League of America #197. The musculature of these two looks great. Both look ripped up without being ridiculous, which is appropriate for a Bronze Ager like Pollard. He even makes Thunderstrike's costume look pretty decent. The use of Hawkman's more modern design, with the pouch belt and more utilitarian pants, works well in this combination. The helmet has a nice low-key look to it, without excessively large Honor Wings, but not losing them either. And the wings look great, as well. All in all a heck of a nice piece of art, which would make for a good cover -- even if the endgame is a foregone conclusion. Image: "Maces High," 2008, Keith Pollard and Josef Rubinstein, retrieved from Comic Art Fans. Today we have another of Sheldon Moldoff's "collect and save" stamps from the early days of Flash Comics. 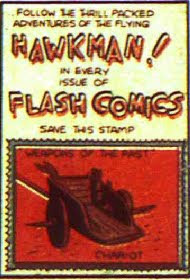 This stamp, featuring a chariot, was originally found in Flash Comics #11. I am trying to think of a time when Hawkman rode a chariot, but I can't think of one. Of course, he has been shown in a chariot as Prince Khufu in ancient Egypt, so that works, at the very least. Image: Chariot stamp from Flash Comics #11, 1940, Sheldon Moldoff.